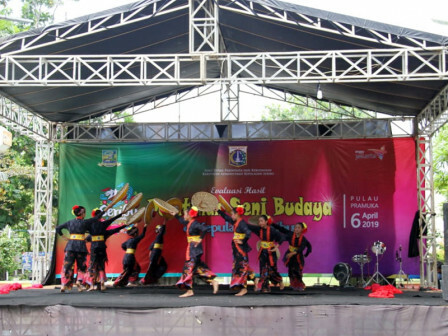 " This is also a forum for mental training for children to perform in public"
The music and dance performances which is kicked off by the Thousand Islands Tourism and Culture Sub-agency for two days, precisely on April 6-7, 2019 at Thousand Island Plaza on Pramuka Island, North Thousand Islands run lively. It is the result of training provided on all residential islands' child-friendly integrated public spaces (RPTRA) a few weeks ago. "This is also a forum for mental training for children to perform in public," said Cultural Development Se ction Head, I Gusti Ayu Suharyani, Monday (4/8). She expressed that the first day features an ensemble music and dance. On the second day, there are performances of marawis (percussion band), hadroh (tambourine ensemble) and qasidah (Islamic pop music). "Certainly the entire performance of the art is displayed by representatives of six urban villages from various ages," she stated.